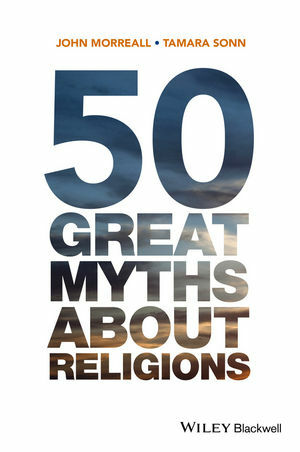 50 Great Myths about Religions is an intriguing, informative, and often humorous introduction to some of the long standing myths that surround religious belief. This engaging book will get its readers thinking about how and why certain myths have arisen, and their continuing influence on our personal and collective view of religion. John Morreall is Professor of Religious Studies at the College of William & Mary, Virginia. His publications include Comedy, Tragedy, and Religion (1999, winner of the Choice Outstanding Academic Book in 2000), Comic Relief: A Comprehensive Philosophy of Humor (Wiley-Blackwell, 2009), and The Religion Toolkit: A Complete Guide to Studying Religion (with Tamara Sonn, Wiley-Blackwell, 2011). Tamara Sonn is the William R. Kenan Distinguished Professor of Humanities in the Department of Religious Studies at the College of William and Mary. Her books include Interpreting Islam: Bandali Jawzi's Islamic Intellectual History(1996), Islam: A Brief History (2nd edition, Wiley-Blackwell, 2009), and The Religion Toolkit: A Complete Guide to Studying Religion (with John Morreall, Wiley-Blackwell, 2011). She is currently an editor of Oxford Islamic Studies Online and co-editor-in-chief of Wiley-Blackwell's Religion Compass.